Caulking is used to fill in gaps or cracks to keep water away from a surface. 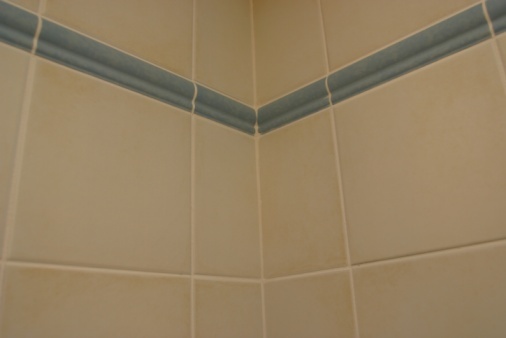 Whether you have caulking around your bathtub tile or your window sills, it will get dirty over time. Mold and mildew are common stains that form on caulking, in addition to dirt and soap scum buildup. You can clean caulking with chlorine bleach to remove stains and get it white again. Spruce up caulking with chlorine bleach. The active ingredient in bleach is sodium hypochlorite. This ingredient, along with water and other inactive ingredients, help to whiten surfaces and remove stains. According to Clorox, sodium hypochlorite also kills 99.9 percent of viruses, bacteria and certain types of mold. This makes it ideal for cleaning caulking, which is white in color and often plagued with stains, particularly from mildew. Bleach can be mixed with water or baking soda to clean caulking. If the caulking is really dirty, the mildly abrasive baking soda will help to lift stains and remove them. To use bleach alone, mix a solution at a ratio of 1/4 cup bleach per gallon of water. Use warm water rather than hot since hot water makes the bleach less effective. If you want to mix it with baking soda for a deeper cleaning, fill a bowl with 1/2 cup chlorine bleach. Add 1/4 cup baking soda and stir well to make a paste. Bleach works best when the surface has already been cleaned to remove surface stains, so first clean the caulking with hot, soapy water. If you are using the bleach and water mixture, dip a rag into the bucket of cleaning solution and scrub it onto the caulking. Let it sit for a few minutes, then scrub again with the rag. Rinse the caulking well with clean water. If you choose to use the baking soda paste, spread a thick coating of the paste onto the caulk with an old paintbrush. Cover the paste and caulk with plastic wrap to help prevent the paste from drying out too quickly. Let the bleach and baking soda paste sit on the caulking for a few hours, then rinse it off with clean water. Reapply the paste again, if necessary, until the caulking is clean and stain-free. Bleach is safe to use as long as it's used properly. Keep in mind that it is toxic and can be harmful if handled inappropriately. Wear rubber gloves when cleaning with chlorine bleach and work in a well-ventilated area. Old clothes should be worn as well since bleach can quickly discolor or damage fabric. Keep bleach out of reach of children. How Often Should You Recaulk a Tub?